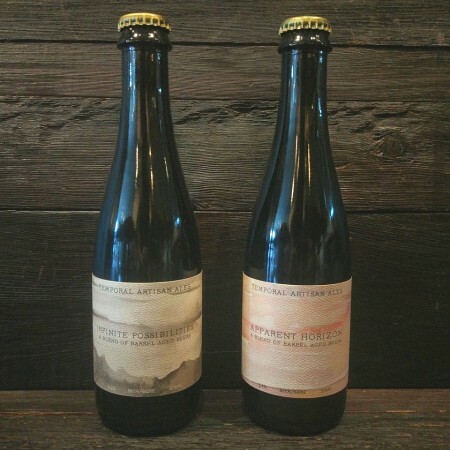 VANCOUVER, BC – A recently launched brewing project dedicated to 100% oak fermented ales has announced the release of its first bottles. Temporal Artisan Ales has been founded by Tristan Stewart and is being operated via a rental arrangement at Luppolo Brewing, where Stewart works as a brewer. Apparent Horizon is a blend of 3 different beers that were fermented and aged in a mix of Merlot and Chardonnay barrels. It has a wonderful aroma consisting of tart stone fruit and rustic Brettanomyces funk. The flavour follows with bright acidity and notes of plum skins, underripe peach, farmhouse funk, and grassy malt. Infinite Possibilities is a blend of 3 different beers that were fermented and aged in a mix of Merlot and Chardonnay barrels. It has aromas of overripe fruit and Brettanomyces funk. The flavour is quite acidic with lots of citrus, chardonnay, oak, and bright stonefruit. Both beers will be available in 375 ml bottles in the Luppolo retail shop, and on tap at the bar, while supplies last.